Place items like recovery gear, clothing, towels, first aid kits, road side equipment, snacks, etc. in the main compartment A. Place smaller items in the outer zippered pocket B (Fig 1). Position the bag so that it’s zipper pull holders are located at the top of the bag (Fig 1). Buckle the bottom strap around the roll bar, without twisting the strap (Fig 2). Buckle the top strap around the roll bar, without twisting the strap (Fig 3). 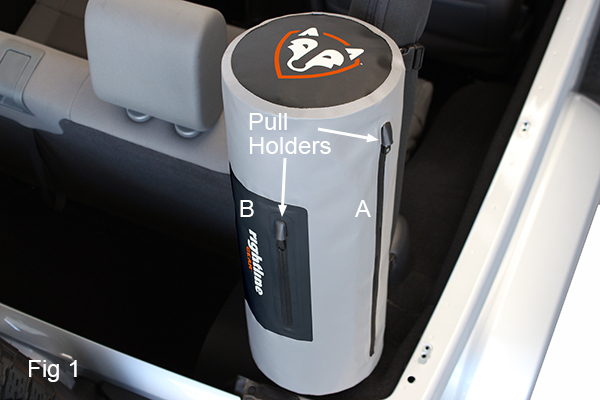 Stretch the bag along the roll bar and tighten both straps (Fig 4). Move the tri-glides towards the loose ends of the straps (Fig 5).